Remind her of how much your love grows for her each and every day with this sweet Two of Us heart ring in white gold from Apples of Gold Jewelry. This lovely ring is available to you in your choice of 10K, 14K, or 18K white gold, which captures the light and adds a bit of a shimmer to your day. A cut out heart sits on either end of the white gold band, which wraps around and comes to a closure with the hearts connecting next to each other. Inside each heart is a single diamond, rated G-H for color and I1 for clarity. The diamonds are 0.03 carats each, totaling 0.06 carats of lovely sparkle! 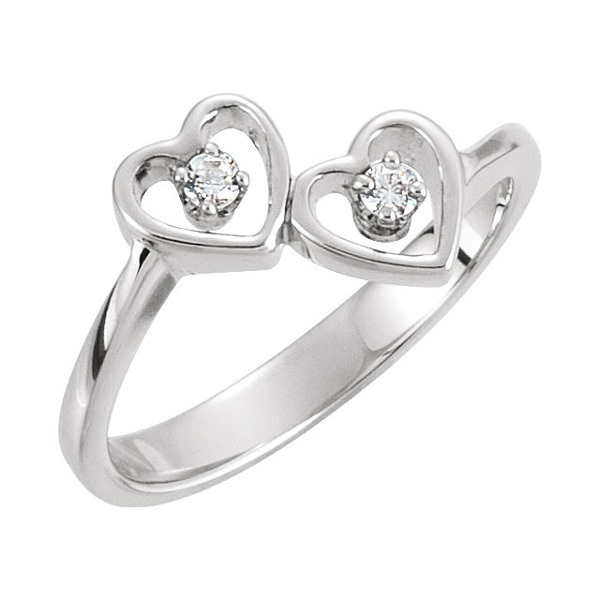 We guarantee our Two of Us Heart Ring in White Gold to be high quality, authentic jewelry, as described above.